How many people look at that picture and think the polar bears were living on some ice and it melted around them and now they are stuck? 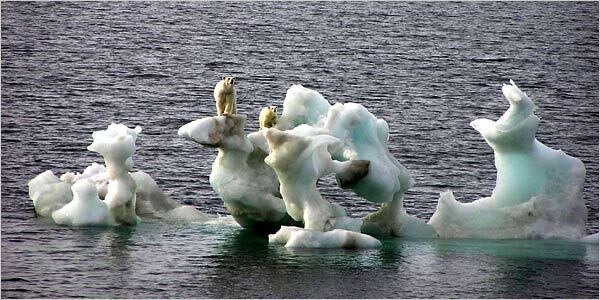 And, yes, I realize a polar bear can drown… if, say, it’s exhausted and swimming over 50 miles. But basically, these things can swim 15 miles easily, at a speed of 6 miles an hour, and they use the edge of an ice floe as a platform from which to hunt. Where’s the photograph of the bear chomping down on a cute baby seal? And, no, I’m not denying that there’s global warming, even as I sit here a double pane of glass away from -12° air. I’m just amused at human behavior, such as the way it is possible to feel arguments at us. In particular, we are susceptible to argument by animal. We love the animal, if it’s pictured right, in a way that pulls our heartstrings.